We’re counting down the five most popular songs in the Billboard Hot 100 Pop Singles chart, for the week ending Sept. 26, 2015. Although we get no new singles this week, it’s still a historic lineup. Let’s begin in fifth place, where OMI holds with “Cheerleader.” With an album on the way, you might think he’s planning a tour…but, is he? The Jamaican singer drops his debut album Me 4 U on Oct. 16, but supporting tour dates have yet to materialize. Right now, his only appearance is a Dec. 5 show at the Grand Slam Party Latino in Miami, Florida. 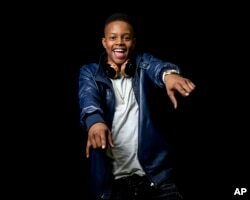 Also holding steady in fourth place is Silento, who unlike OMI is on the road right now. “Watch Me,” has now passed 1.5 million domestic sales. The 17-year-old high schooler is whipping and nae nae-ing his way across the United States in the “Scream Tour.” Also in the lineup are Rich Homie Quan, K Camp, Anthony Lewis, and other rising stars. Here’s where things get interesting: Justin Bieber loses his singles title with “What Do You Mean,” but gains a bunch of award nominations. Justin is up for six MTV Europe Music Awards; that’s the second-highest tally, trailing only Taylor Swift’s nine nominations. Among Justin’s nods are Best Pop, Best Male, and Best Look. This year’s MTV Europe Music Awards ceremony takes place on Oct. 25 in Milan, Italy. 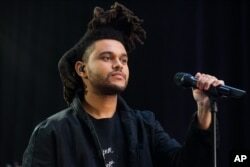 Abel Tesfaye, known by his stage name the Weeknd, performs on NBC's "Today" show on May 7, 2015, in New York. As with our last lineup, The Weeknd meets himself coming and going, only this time it’s higher on the chart. He bumps up a notch to number two with “The Hills.” He’s dating teenage model Bella Hadid. Her stepfather, famous producer David Foster, tells TMZ that he thinks The Weeknd is not only a rare talent, but also a good guy. How’s this for rare: The Weeknd earns a place in the record books this week. In addition to topping the Hot 100, he also leads the album chart with Beauty Behind The Madness. The Weeknd is now the only male artist to simultaneously top Billboard Magazine’s Hot 100, Top 200 album list, and the Artist 100 chart. Only one other act has captured this triple crown: Taylor Swift. What’s next for The Weeknd? We’ll find out next week!